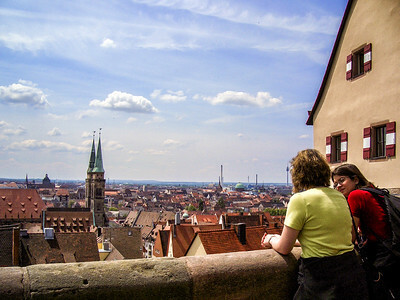 Photos of the people and landscape throughout Germany from North to South including Berlin, Northern and Southern Bavaria, Nurnburg, Bayreuth, Kulmbach, Rothenburg, Ludwig's Castles, the Alps and rural Germany. 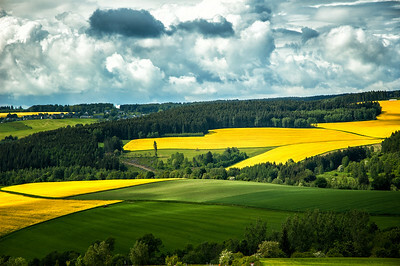 The mustard fields were everywhere as we drove southward from Berlin. 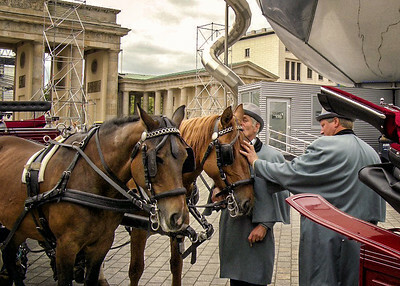 These horses offered carriage rides near the Brandenburg Gate. Here the owner is whispering something into the horse's ear. 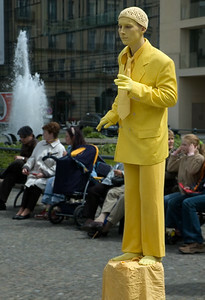 This mime by the Brandenburg Gate would stand so perfectly still that people would not notice him until he touched their shoulder as they walked by. Then they would jump and scream. 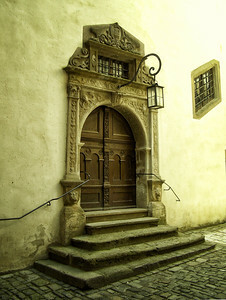 This is a vry famous door in the city hall of Rothenburg. 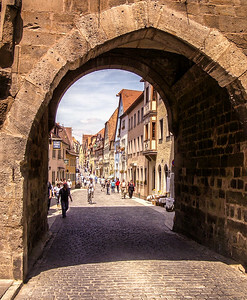 It is depicted in many pictures and etchings coming out of Rothenburg. 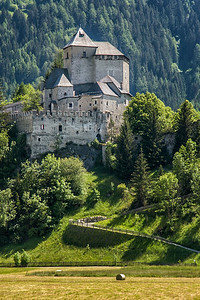 A castle in Southern Austria near the border with Italy, hence a German and an Italian name. 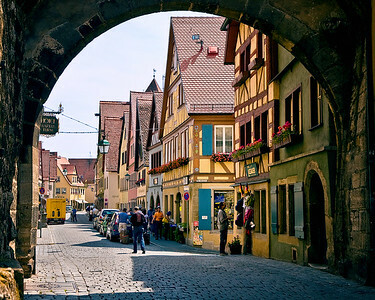 Rothenburg is one of the best preserved old walled towns in Germany and a very popular tourist attraction located in Bavaria southwest of Nurnburg. 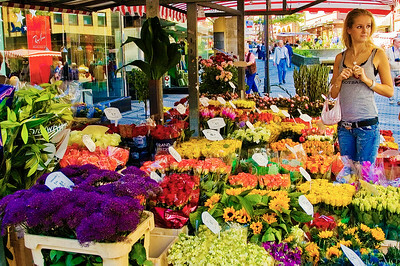 This flower stall was located close to the main market square a few blocks away. 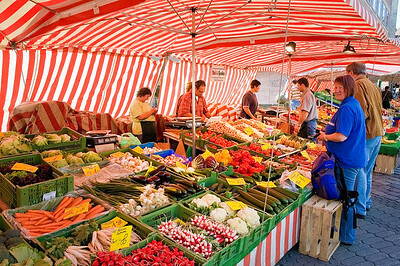 The whole market system of stalls sells everything from flowers to food to hand made goods. 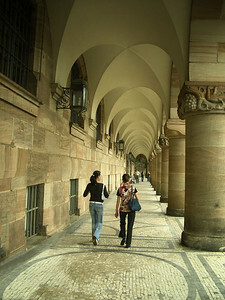 Along the square is a famous church, the Frauenkirche, and a famous fountain, the Schoene Brunnen. 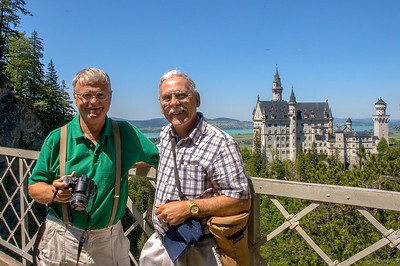 Neuschwanstein castle can be seen nestled on the side of Mt. 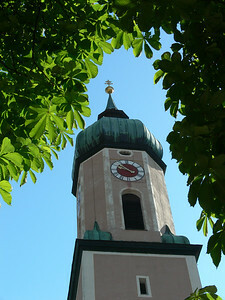 Tegel in Southwestern Bavaria. 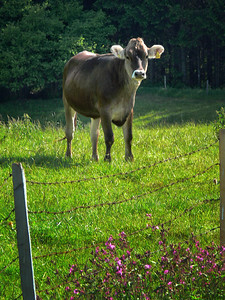 Weismain is a small German town where we visited the soccer star Adi Pinter, a friend of Chuck's. 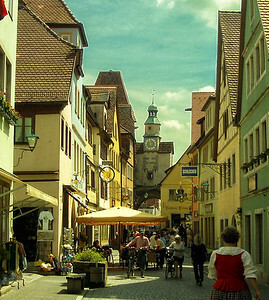 It is a typical picturesque little Bavarian town near Bayreuth. 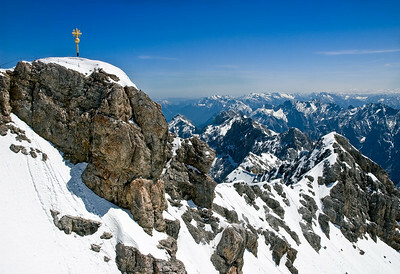 The Zufspitze is Germany's tallest mountain and lies at the northern fringe of the Alps. We went up in a funicular cog wheel railroad car. 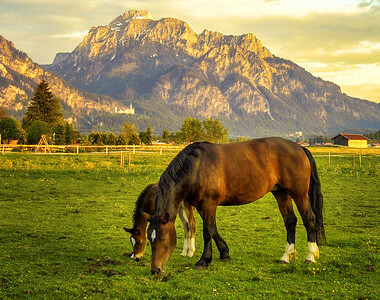 The Austrian Alps are seen in the background. 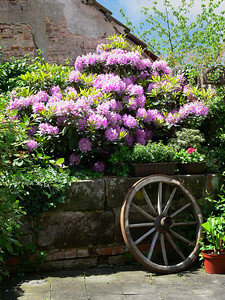 The weather is never very hot, and flowers love the weather. 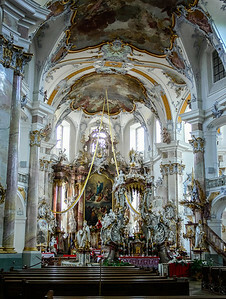 Onion domes and yellow walls seem to be popular in small Southern Bavarian churches like this one, which we just happened upon. 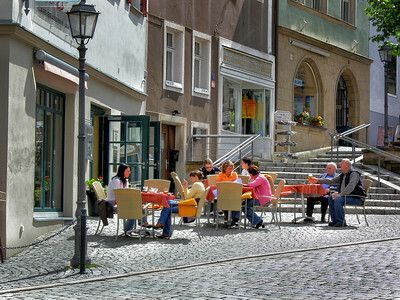 The sign advertizes only fresh Asparagus from Nienburg or as grown in Nienburg, a town in northern Germany. 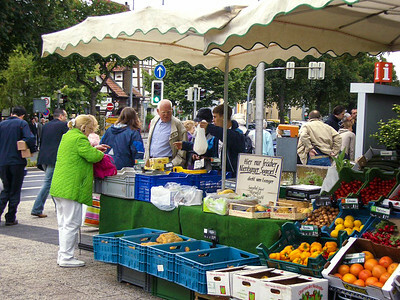 Such outdoor markets are common place throughout Germany. Die Ecke means corner in German. This is a famous scene, which in olden times served as a fish market. Fish were sold out of the stone tank with the peaked roof in the foreground. 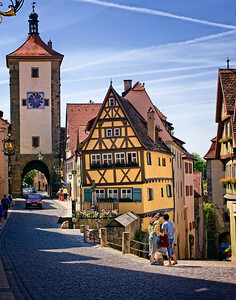 Rothenburg is a well preserved small medievil walled town where walls, towers and gates are common. 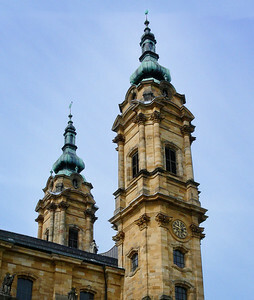 In 1631 the Lutheran town was overwhelmed by 40,000 Catholic leaning troops for quartering. 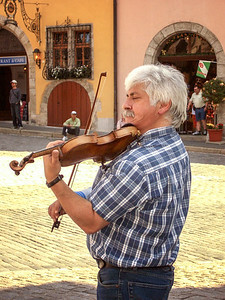 This devistated the town and the plague followed killing many citizens. 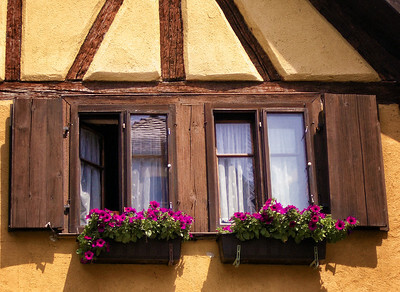 The town was left broke and quit growing, thus preserving its medieval appearance. The market stalls at the Nurnburg Market are colorful and busy. 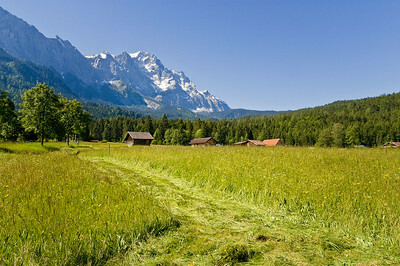 The Alps rise sharply from the farming and forest area of Southern Bavaria. 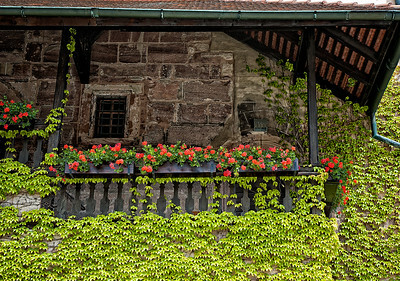 Flower boxes are very popular all over Germany as are timbered houses. 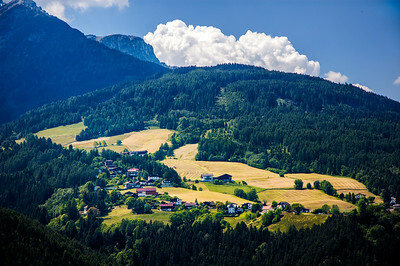 An Austrian village nestled on the mountain side whose name we can't remember. 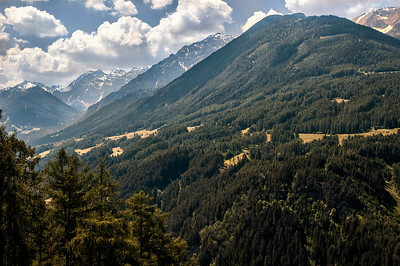 This scene is in the Brenner Pass driving through Austria. 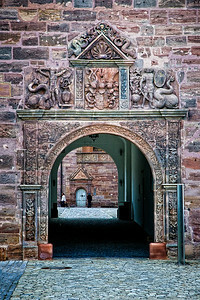 This is inside the courtyard of the Plassenburg Castle. 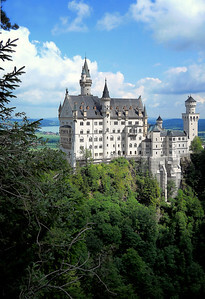 The Neuschwanstein Castle is the dream child of King Ludwig of Bavaria who lived in the 1800s. 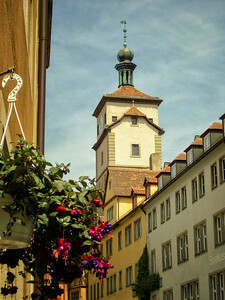 He nearly broke the Bavarian treasury building anachronistic castles that were not needed but tweaked his fancy. He only stayed in this castle for a few nights. He later was found dead, the cause a mystery. Ironically years later they proved to bring huge tourism to the area, a phenomenon unforeseen in his day. 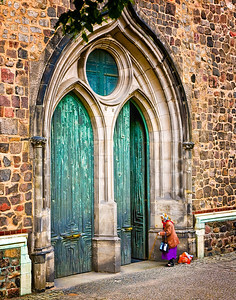 We were near Alexanderplatz when I noticed this old lady was just walking toward the church as we went by, so I waited for her to reach the door. 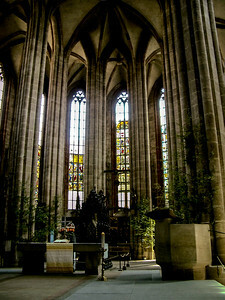 The Fourteen Saints church was started in 1743 in southern Bavaria and is dedicated to fourteen helpers in the Catholic Church who helped during the time of the black plague. 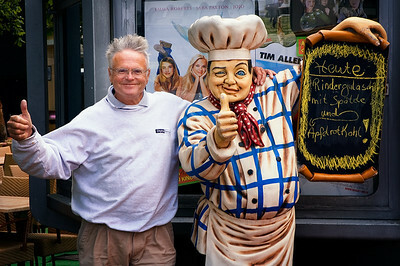 This statue advertising the menu was at a restaurant in Berlin. It is funny to see the two girls in the background poster looking on. 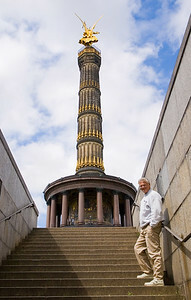 This is a victory column commemorating the Prussian victory in the Danish-Prussian War of 1866. It is 220 feet, and we climbed to the top. 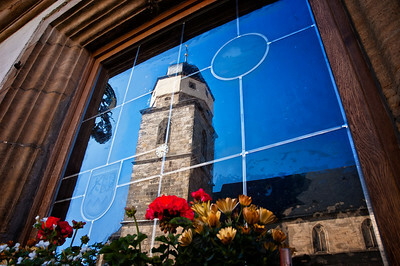 This church is located in Oberammergau Germany, a picturesque Southern Bavarian town. 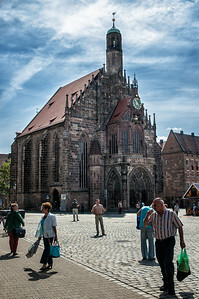 This is a famous old church on the market square in Nurnburg. The Plassenburg Castle houses the largest tin soldier museum in the world. 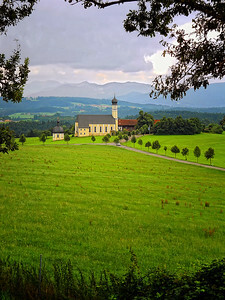 It is located in the Bavarian province of Upper Franconia near Bayreuth. Nearby the River Main originates.